Journeyman Film: Kickboxing Indie, Short. Info, Official Sites, Videos. Journeyman Short and Feature Films! 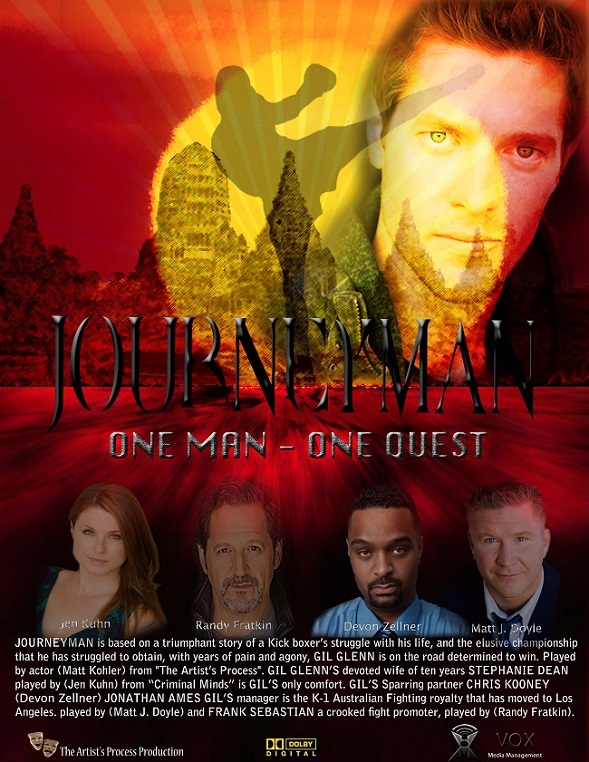 "JOURNEYMAN" Movie Series, a Short developing into Feature Films. Based on a triumphant story of a Kickboxer's struggle with his life, and the elusive championships that he has struggled to obtain with years of pain and agony! GIL GLENN is on the road determined to win. Played by actor (Matt Kohler) from "Hart of Dixie" GIL GLENN's devoted wife of ten years STEPHANIE DEAN played by (Jen Kuhn) from "Criminal Minds" is GIL's only comfort. GIL's sparring partner is CHRIS Kooney (Devon Zellner). JONATHAN AMES, Gil's manager is the K-1 Australian fighting royalty, that has moved to LA, played by (Matt J. Doyle). FRANK SEBASTIAN, a crooked fight promoter, is played by (Randy Fratkin). Watch Journeyman Short plus Feature Film Movie Videos Online, FREE on YouTube Video Playlist!